South Korea’s top internet name Naver Corp. reported a 26.7 percent fall in operating profit in the final quarter of this year as hefty spending for its Google-like expansion beyond the traditional internet platform service ate into its record full-year revenue and brought down the full-year income figure to a two-year low. The company in a regulatory filing on Thursday said its consolidated operating profit for the fourth quarter ended Dec. 31, 2018 was 213.3 billion won ($191.9 million), down 26.7 percent from the same period last year. Net profit dipped 22.9 percent on year to 132.5 billion won, whereas revenue grew 19.8 percent on year to 1.5 trillion won. For full 2018, the operating profit shrank 20.1 percent on year to 942.5 billion won, the first fall below the 1 trillion won milestone since 2016. Net profit sank 17.4 percent on year to 636.4 billion, while revenue jumped 19.4 percent on year to a historic high of 5.6 trillion won. Naver shares closed Thursday unchanged from the previous session at 136,000 won, despite the company’s decision to buy back 735,295 shares worth nearly 100 billion won to bolster shareholder value. The buyback is expected to take place from Feb. 1 to April 30. 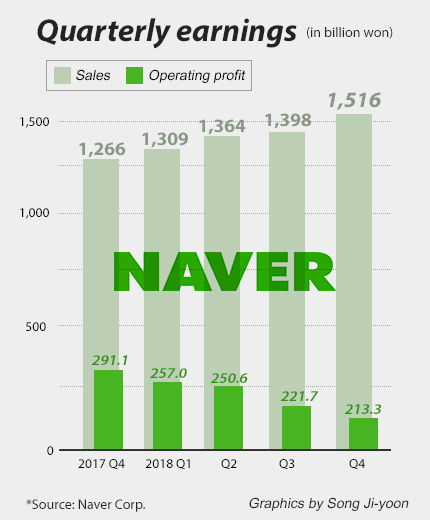 Naver’s profit shrank due to the company’s aggressive spending on R&D in search of new growth engines beyond the internet. It spent 337 billion won in R&D in the fourth quarter alone, up 32.5 percent from the same period a year ago. The company capex also jumped 30.1 percent to 203.4 billion won over the same period. Both R&D spending and capex in the final quarter was the biggest compared with other quarters. The company’s total operating costs also surged 33.7 percent in the fourth quarter to 1.3 trillion won from a year earlier. For full 2018, it amounted 4.6 trillion won, up 32.7 percent on year. Naver jumped into the robotics and artificial intelligence race later than its bigger global rivals like Google. To catch up with the pioneers, the Korean portal giant has been aggressively expanding its investment in future technologies other than internet portal and search engine. The company officially launched Naver Labs, Naver’s R&D subsidiary that focuses on the development of autonomous driving, robotics and artificial intelligence in January 2017. Naver’s Chief Executive Officer Han Seong-sook, in a conference call after the earnings release, vowed to beef up the company’s video contents and e-commerce services as part of efforts to seek for next growth engines. By business, revenue from its mainstay commercial platform expanded 14.4 percent in the fourth quarter from a year earlier to reach 658.5 billion won on growth in retail search advertising. IT platform revenue jumped 59.0 percent on year to 105.6 billion won, thanks to brisk performance of its mobile payment and clouding services. Revenue from its contents business gained 15.8 percent on year to 32.0 billion won, and that of its Japanese subsidiary Line and other platforms surged 26.8 percent to 565.3 billion won. In another separate filing on Thursday, the company announced it will pay cash dividend of 314 won per common share. The dividend yield is 0.3 percent.